A man seen brandishing a glass bottle in a Peterborough street during a brawl has avoided jail. 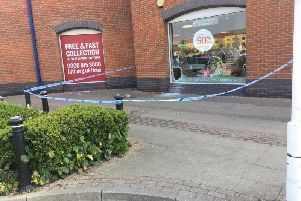 Nathan Stevens (27) of Clipstone Walk, Peterborough, raised the bottle above his head in an alleyway off Broadway in the city centre on at about 4am on July 27 this year. A fight had broken out in the street between two groups of people when he raised the weapon. On Monday he appeared at Peterborough Crown Court after pleading guilty to possession of an offensive weapon at an earlier hearing. The bottle was not used to strike anyone. Judge Tina Landale sentenced Stevens to a 12 month community order with a drug rehabilitation requirement. He was also ordered to pay a £60 victim surcharge and a £180 criminal courts charge.